While remodeling what he eventually dubbed the “unhandy house”, our own Down to Earth Woodworker, Steve Johnson, found there were a few things he would have done differently if he had a second chance. It is probably a bit early to do a full post-mortem on the work done in the “unhandy house” remodeling project, since there are still a lot of unfinished items. Still, mistakes are truly instructive, and lest I forget one of my many “teachable moments” I thought it wise to share now. Figure 1 - Who would have known? This clumsily sealed and hidden air duct took a day to resolve. Every step of the project was planned in what was, I thought, infinite (almost obsessive) detail. Sheet after sheet in my notebook detailed entries like “Day 37, 38, 39 – sand and prep floors.” My mistake was to not fully anticipate and plan for unforeseen problems. The floors took 4 days to sand, not three. The time budget was blown. The dollar budget was also blown with added sanding machine rental costs and additional sanding pads. There truly is no way to make up a day when you are on a tight schedule and working mostly by yourself. Re-routing a hidden air duct embedded in a wall cost me an extra day. Electrical problems cost me three or four days of lost productivity. In the midst of it all, the sump pump began spewing water on the walls from a dry-rotted rubber coupler, and a rush trip to the hardware store and the ensuing repair and cleanup cost me another half a day. No matter how skillful one might be at estimating the time required to do each project, it is wise to add some “buffer” or contingency time to every project. It was, I thought, fortunate to have a recycling center only fifteen miles away where I could dispose of a brimming pickup truck load of material for just $7. In retrospect, 30 miles round trip in my truck with current gas prices equals roughly $10 in gasoline cost. That translates to $17 per load, and so far, I have disposed of 13 loads, or $221 in real cost. Almost every trip to the dump entailed a swing through the donut shop drive-in window for coffee and sugary baked treats, so add another five bucks or more per load. In reality, my misplaced frugality cost me close to $300. Figure 2 - Piles of trash get handled multiple times. Get a big open top dumpster and handle the waste only once. Each trip took roughly two hours, with loading, driving, unloading, and driving back. Those 26 hours of time would have been much better spent working. There is a safety consideration as well. 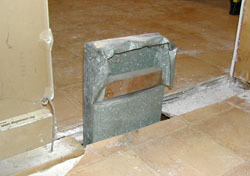 Demolition is dangerous work, and the potential for injury is multiplied by handling the waste material multiple times. 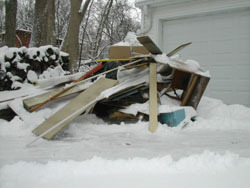 I carried materials to the driveway and stacked the garbage until it looked like a full truckload. Then I loaded the mess into the truck, one additional handling. Then, at the dump, I unloaded everything, marking the third handling of material that was filthy, full of rusty nails, and possibly other noxious “stuff.” With an open top waste container in the driveway, I would have handled the waste material only once. Checking locally, renting a 30 cubic yard capacity roll-off open-top dumpster costs about $550. Considering the time saved, the safety, and the convenience, if I ever take on another project like this, I will order a large dumpster. Most of the base trim in the house had to be removed for floor work, but it was an older profile, not readily available, and it looked like it was going to take a lot of time to replace. The trim was covered in multiple coats of paint. I removed a lot of the trim, but decided to try to “save” some and some I left “in situ,” thinking that it would be easier to paint in place rather than cut, fit, and attach new baseboard. All of that thinking was a giant mistake. As the project continued, I found myself removing more and more of the base, until all that was left was a small section in the hallway. That small section proved difficult and time-consuming to paint, and there was no really “seamless” way to transition from the old profile to the new. I would have been better off to just remove it all in the beginning and be done with it. In fact, my original decision to haul things to the dump, rather than order a dumpster, made the process of ripping things out gradually seem logical. In real life, it caused me undue and extended heartburn later as problem after problem was revealed. The gradual exposure of problems wasted time since many extra trips to the supply stores were required to buy unexpected needed supplies. On a major remodeling job like this, bite the bullet and rip everything out at once. Most problems will be revealed early, and it will be easier to make more complete “to do” and “to buy” lists. Figure 3 - How do you work around this? 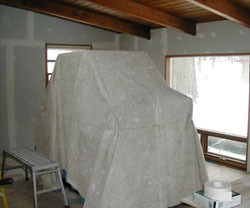 A way-too-early delivery of appliances created problems throughout the project. From the first visit to the “unhandy” house, I could visualize a gleaming new stainless refrigerator and dishwasher to accompany the fairly awesome and relatively new stainless oversize stove the former owner had installed. As luck would have it, the perfect fridge and dishwasher went on sale a week after taking the keys to the house. Buying these items early was a big mistake. Unable to install either, they were in the way. As soon as the items were delivered, I inspected them for physical damage and, finding none, repackaged them as best I could, covered them in moving blankets and a drop cloth, and set them to the side. As the project moved along, more tools took up temporary residence in the house, and things began to get crowded. The appliances were moved at least four times for different projects, and slowed down the work as we took care not to damage them. As fate would have it, when the time finally came to install the appliances, the refrigerator did not work. The equivalent of an entire day was wasted arguing with the dealer, the manufacturer, and the delivery service until the unit was eventually replaced. Had I waited to purchase, the refrigerator would have been delivered, hooked up, and its defect would have been noted immediately and the unit would have been replaced quickly. Had I waited, these bulky appliances would have been out of the way and in no danger of damage. There would have been more “elbow” room, and the work could have progressed more quickly. A few dollars of savings proved to be a point of frustration and wasted time. Do demolition all at once – you may discover all kinds of new challenges all at once, but you will be better able to plan and execute and you will save time! Even if you catch a good sale, think long and hard about buying things before they are needed. Where will you store them? Will they be in the way? Could they be damaged during the renovation? This article first appeared in the Down to Earth Woodworker column in the June edition of Wood News.